This taxonomic dataset comprises of 1:1 orthologs from [x1] species. In this dataset, there are [x2] genes with all [x1] orthologs aligned. The mean aligned codon coverage is [x3]% across all species. The mean dN, dS, and dN/dS across genes from this dataset is, respectively, [x4], [x6], and [x5]. However, these divergence estimates should be used with caution due to the saturation of dS at this phylogenetic distance. 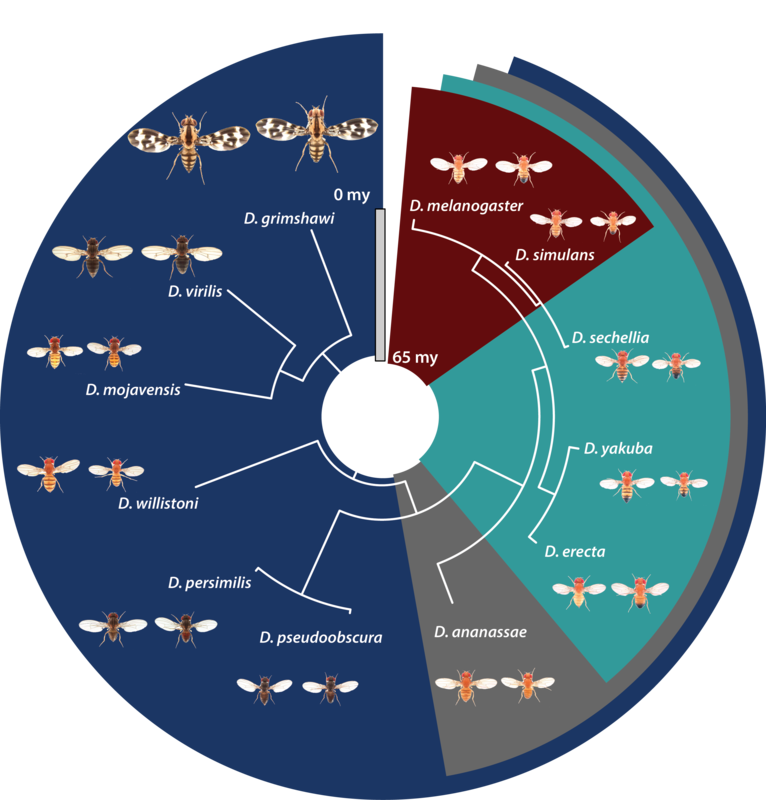 flyDIVaS is a comparative genomics database resource of Drosophila divergence and selection. flyDIVaS, is based on current genomic assemblies, FlyBase annotations, and OrthoDB orthology calls of the original 12 Drosophila sequenced species (Clark et al. 2007). This freely available resource contains melanogaster-centric orthologous gene sets, CDS and protein alignments, divergence statistics (% gaps, dN, dS, dN/dS), and codon-based tests of positive Darwinian selection. Genes and their orthologs can be selected from four different taxonomic datasets differing in phylogenetic depth and coverage density and visualized via interactive alignments and phylogenetic trees. Please Enter a Gene ID before proceeding. Unfortunately, no flyDIVaS results exist for . Either your queried gene lacks 1:1 orthologs or could not successfully complete all PAML model analyses. Please review orthologies at FlyBase. You have requested an unknown, expired or non-coding gene. Please check the spelling and/or current status in FlyBase. [n], also known as [n1], is represented by its longest transcript, [n3]. The mean aligned codon coverage is [n3] % for [insert species group]. Estimates of dN, dS, and dN/dS are, respectively, [n4], [n8], and [n5]. However, these divergence estimates should be used with caution due to the saturation of dS at this phylogenetic distance.This gene [n6] show signals of positive selection when comparing M1a v M2a PAML models; [n7] show signals of positive selection via M7 v M8 models; and [n9] show signals of positvie selection via M8 v M8a (Yang 1997; Swanson et al. 2003). Site-specific models of positive selection can not be evaluated in PAML with only two species. For more information on this particular gene, click this FlyBase link.